The Daily World confirmed the identity of the developer “The Mrs. Chance Wong Co. has taken out a permit for the erection of a line of brick stores buildings, two storeys high” but there’s nothing else that we’ve found that tells us who, or what Mrs Wong was. In 1920 Man Sing Lung’s confectionary store, a general store (On Hung Lung) and a grocers were here. In 1928 there was a Chop Suey House – the Amer, and a restaurant, the Kwong Tong Café. The upper floors were residential – listed as ‘Chinese rooms”. The Kwong Tong was still there in 1935, but a year later the Mandarin Gardens had opened, charging 50 cents to get in on weekdays and a dollar on holidays and Saturdays. It was a cabaret, managed by W Alex Lee, but with an extensive menu (as a copy in the UBC digital collection shows). Although it opened at 6pm, the orchestra didn’t start playing until 10pm, and liquor was (at least officially)prohibited. Some of the food offered was ‘western’ (Chicken A La King cost $1.25, although you could get a Kraft Cheese Sandwich for a mere 45 cents), but the Chinese menu was longer, with Chow Mein or the Mandarin Special each costing $1.00. In 1943 Charlie Nelson, a Vancouver nightclub operator, took over the club and added more cabaret acts to the operation. In ‘Vancouver Confidential’ Tom Carter writes about local singer Mimi Hines who recalled playacting cowboy shootouts on a deserted Pender Street with Sammy Davies Junior after the club had closed for the night. Next door was an older building, designed and built by S K Champion at a cost of $12,400 in 1902. Samuel K Champion was a builder and developer in partnership as a building materials supplier as Champion & White. The company had their own wharf, and Mr Champion was the first to attempt to bring aggregate off one of the city’s beaches – although the first time he tried to use the home-made barge to carry the gravel, it sank. Champion and White worked on the World Building (today’s Sun Tower) – we know that because they tried to get payment for some work – eventually going all the way to the Supreme Court (where the company lost the legal argument). There was a rival to the Mandarin Gardens here: while the Gardens had a full scale cabaret with burlesque and dancing girls (the Mandarinettes) in the 1950s, the Marco Polo Club was also operating next door. A poster in the Museum of Vancouver has a description that says it “opened in the 1960s, closed in early 1980s, the first Chinese-style smorsgasbord and nightclub in Vancouver’s Chinatown.” The venue featured acts like Sly and the Family Stone, but it had evolved from a late 1950s version run by Alex Louie where the venue offered a chorus line of “four pretty Chinese girls in strapless bras, short skirts and fishnet stockings”. The Mandarin’s premises were demolished in 1952 soon after this picture was shot; for a while a small single storey building made up the difference on the remainder of the lot. The replacement building, built in 1984 by Marco Polo Holdings, was once a TV studio, but is now part of the Vancouver Film School. Here’s one of the West End’s apartment buildings that were built over 100 years ago. It’s Washington Court, built in 1910 for Peter Agren and designed by Arthur J Bird. Today it has 44 apartments on five floors. When it was built it cost $95,000 and had five floors, but subsequently, about seven months after the initial building permit another floor was added at an additional cost of $18,000. We’ve seen the other building that Agren developed on Thurlow Street, where again A J Bird was the architect. We identified what we had found about Agren, a Swedish contractor and builder, in that post. Agren’s home on Comox Street (now part of Mole Hill) is still standing as well. Agren appeared in Vancouver in 1904, and two years earlier we can find him applying for two timber cutting licences in Revelstoke on his ranch there. What seemed curious is that today that additional top floor has been removed, and the building is back to five storeys. It took place some years after 1928, when this picture was taken. 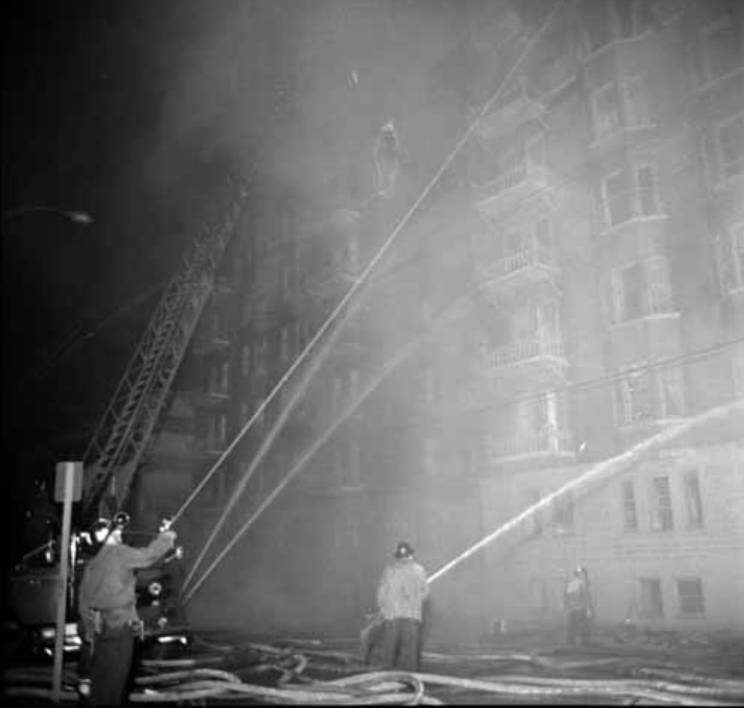 Thanks to Dennis who told us when it happened – this VPL image from November 1966 shows the building on fire. The top floor was so badly damaged that it was removed, and only the original five floors were restored. F W Hart had been in the city for nine years when this picture of his house was taken. He arrived in New Westminster in 1885, walking from Semiahmoo Bay. He was aged 28, unmarried, and he’d had an interesting earlier life. He was born in Illinois into a Swedish family (originally the Hjort family) and left home, joined the US Voluntary Army “fighting Kansas Indians” before running a livery stables (including work as a ‘bronco buster’. He worked for a furniture-maker and undertaker in Walla Walla, Washington before joining his brother who lived in Semiahmoo then heading north across the border. In Granville he had premises near Maple Tree Square – in his reported words “I squatted on a piece of the shore between Carrall and Columbia Avenue, and built a store about 150 feet from the Maple Tree on the water side of Alexander Street”. He built a second store on the end of the block now occupied by the Hotel Europe, a warehouse and a furniture factory, only to lose it all in the 1886 fire (he estimated his losses at between $20 and $30,000 at the time). As with most of the town, he started up straight away, buying and selling goods as well as building furniture and coffins – leading to him becoming the undertaker. He was heavily involved in supporting the election of Mayor McLean as the city’s first mayor, and had favoured the city remaining as Granville rather than Vancouver, which he thought would be confused with the Island and the American city of the same name. Mr. Hart acquired a roller skating rink that had been built originally in Port Moody. In the newly named city he added a stage to the ‘building’ (it only had a canvas roof), built bench seating and reassigned it as Hart’s Opera House. He brought opera companies north from Seattle as well as theatrical troupes. One engagement featured Katie Puton in “A Texas Steer or Money Makes the Mare Go”, written in 1890 by Charles H. Hoyt, an extremely successful dramatist. It included having a horse on stage – not something the stage had been designed for, leading to the horse falling through the boards. In 1899 he married Josephine Crawford in the Presbyterian chapel on Richards Street (the church had yet to be built). It featured a brass band, and the sidewalk covered with red carpets. He built a new house for himself nearby on the corner of Georgia and Cambie in the same year (just before his June wedding) which is probably the smaller building on the right in the picture. Even five years later the street hadn’t been paved, and the planked sidewalk ran out. In 1893 Mr Hart started losing money as the economy collapsed. Up to that point he had been very successful – “my average net gain for 10 and one half years was over $1,000 a month for the entire time”. He said it was a $25,000 loss in the furniture factory that made him decide to leave, presumably selling his house at the same time, (although he does appear again briefly in 1896 at this address). His description to City Archivist Major Matthews many years later of what he did next gives a sense of the early pioneers. “I left Vancouver in 1895 and went off down through the States and lost a lot of my money. I left with more money than any single man in Vancouver could muster at that time. I had it in a bank. I lost some in Utah, some more at other places, and then went to Rossland where I made some more, and then went up to Skagway and Dyea. Dyea is a town opposite Skagway, and arrival, just as Moodyville was a rival to Hastings Mill. I corralled the lumber output of the two sawmills up there, and built the whole town of Dyea in 90 days. There was a rush town of thirty thousand there, some in tents boarded up on the sides and canvas roof, you know what a mining rush is like. I built one three-storey hotel in three days, and turned it for double what it cost me. I had three clipper scows running backwards and forwards from Seattle bringing up lumber. I had $250,000, but a slump came along overnight and I lost it, but I had a cargo of goods which I had been packing over the hill going into Dawson all that winter, 1897-8, at the cost of 26¢ a pound for 26 miles.” Josephine Hart died, and aged 60 Frank remarried in 1917 in Vancouver to his late wife’s cousin, Amelia Ferguson, a widow eight years younger than Frank. Frank died in Prince Rupert in 1935 and Amelia in 1949 in Vancouver. The larger house on the corner appeared in 1890. It was run as a boarding house, initially by Miss Anna Hart (probably Frank’s sister, who had been with him from at least the time of the fire), then in 1892 by Miss M McDonald and in 1894 by Miss Kate Donelly. In 1890 the tenants were two carpenters, a stonecutter, a teamster and RG Gordon (of Gordon and Robinson) who ran a business college, as well as Miss Ellen Hart. The 1894 image says the women in the picture were (left to right): lower verandah: Miss Annie Donnelly and Miss Kate Donnelly (Mrs. H.E. Campbell); upper balconies: Annie Mcallister and Margaret Donnelly (Mrs. D. Wilson); Photograph shows Frank W. Hart’s house to the right. Today there’s the Sandman Hotel, built in 1976 and designed by Herwig Pimiskern Architect. (There’s a later Cambie Street addition that was designed (coincidentally in terms of his name) by Steven Hart Architecture. It would seem that this building was originally built in 1908, although we don’t know who designed it. It’s attributed to W H Chow – but we haven’t found anything to confirm that, although he did design the 1920 alterations. The first buildings on this site were two houses, addressed as 117 and 119 Dupont Street. They were on the site before 1901 – in 1895 the first time they appeared in the street directory they were occupied by Miss Annie Hood and Miss E Johnson. The ladies’ profession was one of the reasons the street name was switched from Dupont to Princess in 1898, once they’d been persuaded to move on. A little later the name switched again, this time to East Pender, and in 1908 this location appears as ‘New Block’ and a year later a series of Chinese businesses had opened their doors, including Charlie Won & Co who sold cigars and fruits, and Yuen Sang Co listed as Chinese merchants. When it was first built this really wasn’t a Chinese-styled building at all, although it was in the heart of Chinatown, and all the tenants over the years were Chinese. That was the rule – not the exception – in design terms; there were no ‘Chinese’ style balconies on any Chinatown buildings built before 1900, and relatively few before 1910. By 1913 a Mr. Hamilton was the owner of the building. F Hamilton hired C Ting to make repairs in 1913. (There’s another permit for 1914 when W H Chow designed repairs for Quang Sang & Co at 125 1/2), and then a series of further repairs for owners identified as F J Hamilton in 1915 for 125 (again by W H Chow), repairs designed and built by Toy Get for ‘Hamilton’ in 1916, for M Hamilton in 1917 and N Hamilton in 1918. Finally W F Hamilton made repairs to 121 E Pender in 1917. We assume all these various Hamiltons were really Frank Hamilton, who is said to be shown in the picture. Frank is elusive – various Francis and Frank Hamiltons come and go, but in 1915 a Frank J Hamilton was living in an apartment in Nicola Street. There’s a picture of a new 1908 house on Burrard Street identified as belonging to Francis J Hamilton, and another (or the same) Frank Hamilton was a resident in Cedar Cottage in South Vancouver, working for the Vancouver Creamery Co.
Around 1920 the building was acquired by new owners. The elaborate balconies were added in 1921 when a $14,000 reconstruction of the upper part of the building took place. The top floor of the 1908 building was removed, but the store front looks as if it’s still the original 1908 millwork. The architects were G L Southwell and J A Radford – although neither were well-known architects; Southwell was a draughtsman (wrongly identified as Southall on the permit) and Radford was frequently employed by the Vancouver Sun to illustrate articles and prepare reviews of exhibitions. Their clients were one of Chinatown’s family associations, the Wong Kung Har Tong (the Wong family association). A 1920 permit had been submitted by W H Chow to add an extra floor to the building. Although he was highly competent, and very experienced, Chow was refused admission to the Architect’s Institute, so it’s quite possible that the Radford and Southwell design was really his. There were new meeting rooms behind recessed balconies, a key feature of the later Chinatown architectural style. Other community associations also came to be associated with the building including the Chinese Community Club and the Hai Fung Association. They show the evolution of the role of community associations in Chinatown; the Hai Fung Association is a more recent youth organization established independently of the older place and surname associations. Hai Fung attracted new immigrants who brought with them new ideas about the meaning of being Chinese in Canada, challenging the established tongs. The Mon Keang School was established on the third floor in 1925, teaching the Chinese language and customs to the tusheng, or children of overseas Chinese born in Canada. This reflected the value placed on education in perpetuating Chinese culture, and because it gave Canadian-born children the skills required to function successfully in a predominantly Chinese-speaking environment. We saw what this view looked like in 1929 in an earlier post. We looked in more detail at the building on the corner in another post. Remarkably few of the buildings further east (up the street) have changed very much since the earlier 1929 image, or since this 1978 image. The biggest change (in summer in particular) is the addition of street trees. Next door to the hotel is a 1903 building designed by W T Whiteway for merchant, Chu Lai. He arrived in British Columbia in the 1860s, worked in the Cariboo and by 1876 he was able to open his own firm, Wing Chong Company, at the corners of Store and Cormorant streets in Victoria. He was Hakka from Guangdong province, and his company became the centre of the Hakka community. Chang Toy (founder of Vancouver’s Sam Kee company), when he first arrived in the area stayed at the company’s property before finding work in New Westminster. The Sam Kee company developed the hotel building on the corner in 1911. Chu Lai died in 1906 in Victoria, survived by four wives (two living in China), five sons, and three daughters. The 3-storey building next door is a mystery to us – completed around 1910, we haven’t managed to identify a client or architect. There’s a small, more recent building to the east of that, built in the 1950s, and then the substantial Wong’s Benevolent Association with the Mon Keang School, and the Lee Building is beyond that (which we featured in an earlier post). On the far right of the picture is the Sun Ah Hotel, home to the Ho Ho Restaurant (today Foo’s Ho Ho). It was designed for Chinese merchant Loo Gee Wing by R T Perry and R A Nicholais. 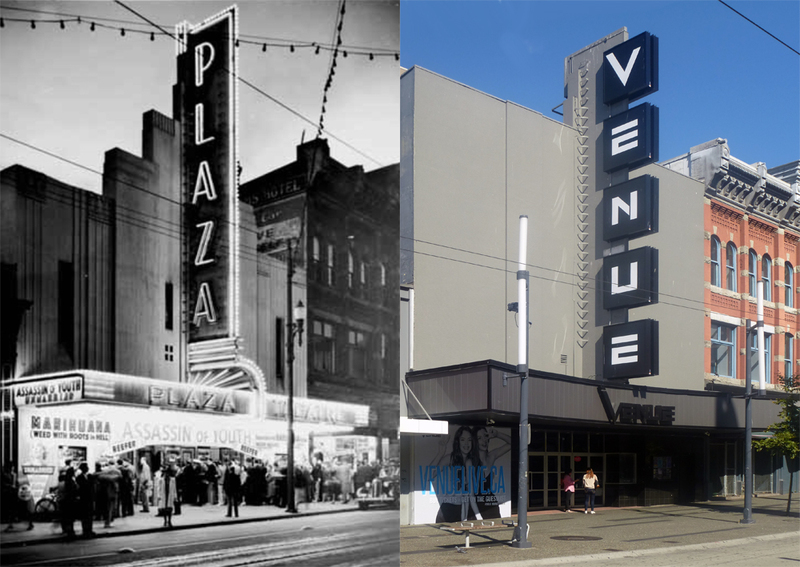 Here’s a 1930’s picture of the recently completed Plaza Cinema on Granville Street. 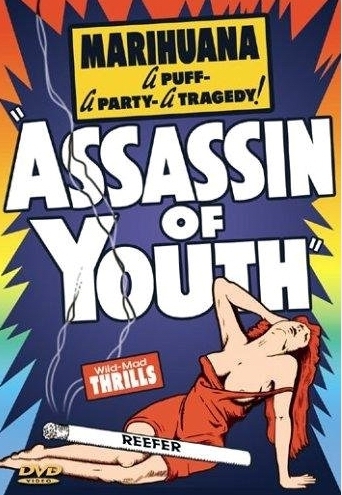 We can date the picture from the film that’s showing – “Assassin of Youth”. There’s a copy of the movie online these days, so you can make your own mind up about its quality and accuracy. In 1937, when it was released, it portrayed “a high-school girl who gets involved with a ring of teenage marijuana smokers and starts down the road to ruin. A reporter poses as a soda jerk to infiltrate the gang of teen dope fiends.” One puff of a joint turns clean cut kids into either hardened, remorseless criminals or maniacs. The cinema seems to have managed to attract quite the crowd to view the film, but maybe the fact that the theatre was only a year old in its new incarnation helped. The cinema was reopened as the Plaza in 1936 and renamed as the Odeon in 1963. It closed in 1987 when the Granville 7 opened further up the street, but was reopened by Famous Players as the Plaza again for 3 years from 1988. It briefly reopened again in 1993 and continued running on-and-off until it closed for good as a movie theatre in 1997. After significant modifications the theatre reopened as a club, initially the Plaza Club and more recently Venue, a 2-level space that can accommodate 500 people and which features both DJs and live shows. We noted how D J McPhalen built at least two properties on Main Street in our previous post. Here he is, with his family in front of his house at 209 Harris Street. Today Harris is known as East Georgia. Mr McPhalen was almost certainly a former constable who moved to the city and became a contractor. He was living on Harris Street from 1888, listed as a contractor and he may have been the McPhalen who was a furniture dealer with a Mr Ash on Hastings in 1887. Dan McPhalen was born on Christmas Day 1852 (and not in 1853, 1854 or 1855 – despite what some census enties might suggest). His wife, Caroline (who was 11 years younger) was born in Ontario, and in 1891 they had 3 children who were listed on the Census – so we can identify them in this 1889 image. Mary was the oldest – aged four, standing to the right of her father. John was a year younger, and he had the splendid tricycle, and Ellen was two years younger than John. We now know from a family member that Dan was born in Humberstone, Welland County, Ontario in 1852. Initially he moved to Rapid City, Manitoba in 1879, and then to Vancouver in 1886. His wife Caroline Bollman was born in Port Colborne, Niagara, Ontario in 1864. They were married in Rapid City Manitoba. Within the family Caroline was affectionately known as ‘Lena’. In the 1901 census Dan’s wife was recorded as Lena, a lodging house keeper, and he was a contractor, with all three children still at home. In 1901 there was another McPhalen living two doors down from D J McPhelen; Charles was recorded as a carpenter. He was later joined by his brother William, and they went into business as contractors known as McPhalen Brothers. These were both Dan’s younger brothers; all the records that separately show their father identify him as Cornelius McPhalen. The brothers built a number of structures in the Vancouver area, including four schools and the China Creek trunk sewer. For a short time immediately before and during WW I they operated as Hodgson, King and McPhalen Bros. In 1917, William enlisted and fought with the CEF in France. After the war, the partnership with Hodgson and King was not renewed. The firm Hodgson, King and Marble constructed the Burrard Street Bridge and is still in business as HKM. Mr. McPhalen built a number of the building near his home, including the London Hotel across the street from his home. By 1908 the McPhalen Block was located at 628 Westminster Ave (today’s Main Street), Daniel McPhalen ran his business from 730 Westminster Ave, and his home was 575 W 10th (on the corner with Ash St), where he stayed for many years. He died in 1921. Today the site has a 25′ wide building, as it did in 1899. but it has 9 storeys of apartments over new retail space known as ‘The Flats’, completed earlier this year.